Project Cost The real, present value of costs to create the project or intervention. Costs could be either up-front or ongoing. For example, it may make sense to use total development costs if the project involves real estate development. Operating YearsMinimum expected number of operating years. If unsure, use the term of capital to support the project. Children who do not have adequate nutrition are less healthy, suffer developmental impairments, and have lower educational achievement 1. Recent studies have uncovered a strong correlation between housing costs and food insecurity 2. To estimate the impact of LIIF-supported affordable housing on food expenditures, we draw from Bureau of Labors Statistics Consumer Expenditure Survey (CES) data, reported in the 2013 “State of the Nation’s Housing” by the Joint Center for Housing Studies of Harvard University. 3 This report shows that families in the bottom expenditure quartile (a very conservative proxy for low-income) who live in housing that is affordable to them spend significantly more—around $123 per month more for families with children, and around $88 more for all renters—on food when compared to their counterparts who are more burdened by housing costs. 4 We model this incremental increase in food expenditures over the term of each project’s affordability restrictions, assuming a 3 percent annual growth rate in this period to correspond with inflation and rising costs of living. 2 See, for example: Fletcher, et al. 2009. “Assessing the effect of changes in housing costs on food insecurity.” Journal of Children and Poverty: Vol. 15, No. 2, 79-93. 3 Joint Center for Housing Studies of Harvard University. 2013. “The State of the Nation’s Housing 2013.” JCHS tabulations of US Census Bureau, American Community Surveys. 4 Bureau of Labor Statistics, 2011. Consumer Expenditure Survey. Website: http://www.bls.gov/cex/ Also cited in: The State of the Nation’s Housing 2012. Joint Center for Housing Studies of Harvard University. Permanent supportive housing is well known as an effective strategy for improving life outcomes for the chronically homeless—particularly those with chronic and complex illnesses. This intervention also generates significant public cost savings, primarily from reduced health services. We draw from a 2009 study 1 by the Economic Roundtable to estimate medical cost savings 2. The study specifically found that incremental monthly cost savings to public agencies (e.g., County health services outpatient clinics) and agency sub-departments (e.g., corrections medical services) 3 providing physical and mental health services were $1,853 per month, or $22,242 per year, for the chronically homeless living in permanently supportive housing. We use this figure to estimate medical cost savings over the course of a project’s affordability restriction term, assuming a 6 percent annual nominal growth rate in savings due to rising medical costs (the same rate of increase that the Centers for Medicare & Medicaid Services projects for the next 10 years). 2 We chose this study based quality of the data available to the authors, the comprehensiveness (across multiple risk factors such as mental health status, substance abuse problems, and HIV/AIDS) and size of the study population, and the fact that its savings figure falls somewhere in the middle of the ranges in medical cost savings quoted in other studies. As such, it seemed to be a reasonable but conservative estimate to apply to the LIIF portfolio of permanent supportive housing projects. 3 A nominal percentage of health-related costs for this population (2-3 percent) was tracked to private hospitals. The high cost of housing is one of the most pressing challenges facing low- and moderate-income households today. More than half of households earning less than $30,000 per year spend over half their income on rent, forcing painful tradeoffs and leaving little for other basic necessities such as food, medical care, and transportation. 1 Further, overheated markets lead families to sacrifice safer, more resource-rich neighborhoods for cheaper housing. Conversely, research shows that safe, decent affordable housing in resource-rich neighborhoods not only relieves financial pressure, reduces stress, improves health and creates a platform for other social investments to take root. 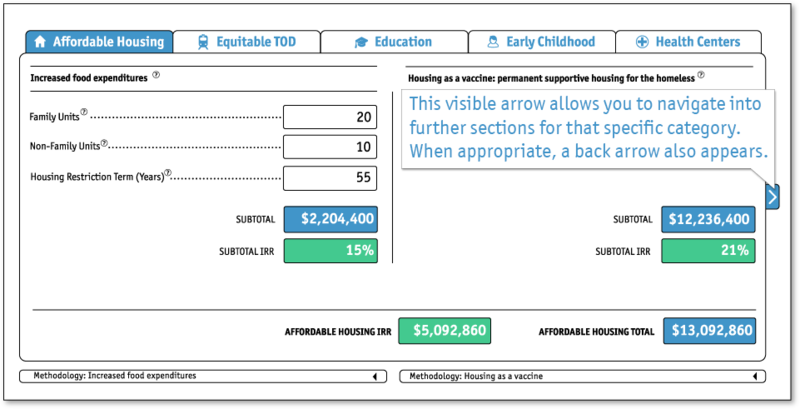 LIIF calculates the social value of affordable housing in numerous ways. Here, we focus on income boosts generated by LIIF-supported affordable housing projects—a measure that directly responds to our mission of poverty alleviation. 2 We calculate the boost in discretionary income generated by housing affordability as the difference between market and affordable rents of the properties we finance. We assume that this impact holds for the project’s affordability restriction period, assuming a 3 percent annual growth rate in this period to correspond with inflation and rising costs of living. 1 Joint Center for Housing Studies of Harvard University. 2013. “The State of the Nation’s Housing 2013.” JCHS tabulations of US Census Bureau, American Community Surveys. 2 Although income boosts translate to economic spillover effects on the local and regional economy, we do not track these impacts because they are less directly relevant to our mission. 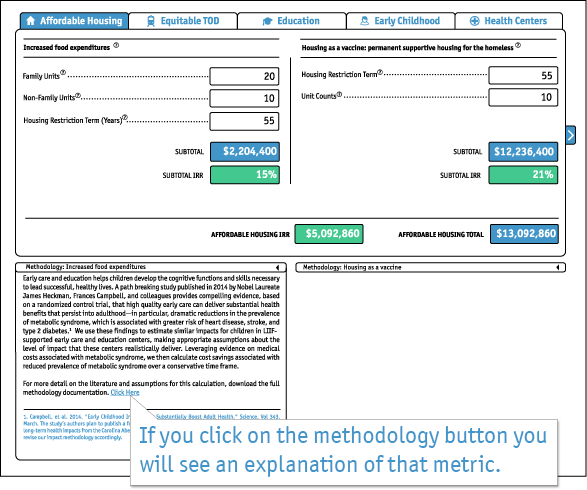 We draw on evidence from the U.S. Department of Housing and Urban Development’s Moving to Opportunity (MTO) experiment to estimate the health value of housing’s location—in particular, the finding that moving from public housing in a high-poverty area to a relatively low-poverty neighborhood generated large reductions in diabetes and extreme obesity among women. 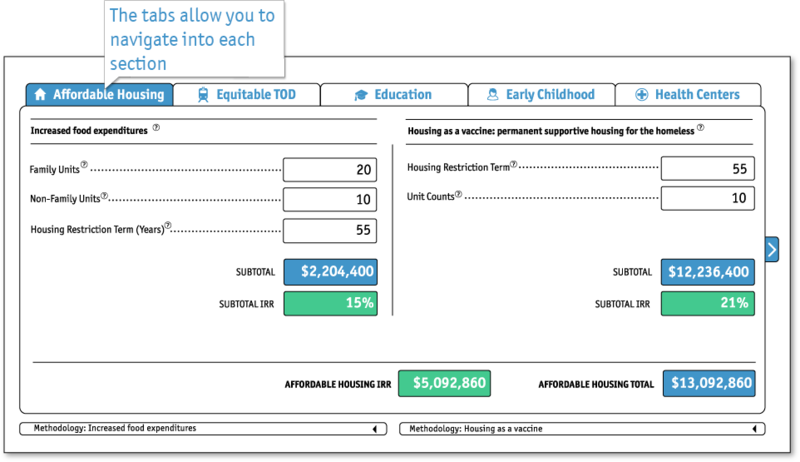 1 We use this evidence to model health improvements by increasing access to low-poverty, “healthy” communities—specifically, those in areas that meet the same criteria for “opportunity” neighborhoods that MTO used. We draw on evidence on annual medical costs associated with diabetes and extreme obesity to estimate medical cost savings generated over a project’s affordability restriction term, assuming a 6 percent annual nominal growth rate in savings due to rising medical costs (the same rate of increase that the Centers for Medicare & Medicaid Services projects for the next 10 years). 1 Ludwig et al, New England Journal of Medicine summary of MTO found that a 10 percent drop in poverty was associated with reductions of 6.2, 4.3, and 3.2 percentage points, respectively, for class II and class III obesity, and diabetes. A 2015 study of long-term effects on children from families in HUD's Moving Opportunity (MTO) experiment revealed that, by their mid-20s, MTO participants in the experimental group who moved from high-poverty neighborhoods to low-poverty areas before age 13 experienced a range of positive social effects—including higher earnings—relative to the control group that had not been detected at the final of the original MTO final impacts evaluation. We use this study’s finding on long-term earnings increases to estimate the same kind of impact on children who gain access to LIIF-supported affordable housing projects in low-poverty neighborhoods. Transit-oriented development (TOD) has been shown to generate positive human health outcomes through multiple pathways—for example, by increasing physical activity, or by improving access to health-promoting services and amenities. Further, equitable TOD—which incorporates housing and services targeted to lower- and moderate-income households—can create and preserve access to these health benefits for these populations, and thus can serve as a critical platform for addressing health disparities and inequality. To estimate health improvements from our TOD investments, we draw from the only available experimental evidence demonstrating that increasing access to transit generates measurable health improvements—a 2010 longitudinal study of people living near the South Corridor Light Rail line in Charlotte, North Carolina before and after it became operational, setting the stage for a “natural experiment.” To estimate medical cost savings generated by LIIF-supported TOD projects, we pair this study’s findings on weight loss associated with commuting by transit with evidence on ridership near transit, and medical costs associated with losing weight. We assume an impact period equivalent to the project’s affordability restriction term, assuming a 6 percent annual nominal growth rate in savings due to rising medical costs (the same rate of increase that the Centers for Medicare & Medicaid Services projects for the next 10 years). Early care and education helps children develop the cognitive functions and skills necessary to lead successful, healthy lives. A path breaking study published in 2014 by Nobel Laureate James Heckman, Frances Campbell, and colleagues provides compelling evidence, based on a randomized control trial, that high quality early care can deliver substantial health benefits that persist into adulthood—in particular, dramatic reductions in the prevalence of metabolic syndrome, which is associated with greater risk of heart disease, stroke, and type 2 diabetes.1 We use these findings to estimate similar impacts for children in LIIF-supported early care and education centers, making appropriate assumptions about the level of impact that these centers realistically deliver. Leveraging evidence on medical costs associated with metabolic syndrome, we then calculate cost savings associated with reduced prevalence of metabolic syndrome over a conservative time frame, assuming a 6 percent annual nominal growth rate in savings due to rising medical costs (the same rate of increase that the Centers for Medicare & Medicaid Services projects for the next 10 years). 1 Campbell, et al. 2014. "Early Childhood Investments Substantially Boost Adult Health." Science. Vol 343. March. The study’s authors plan to publish a follow-up study on the actual medical cost savings associated with long-term health impacts from the Carolina Abecedarian Project. Once these results become available to us, we will revise our impact methodology accordingly. Several recent studies have used data from multiple random assignment experiments to propose estimates for early care and education’s long-term societal benefits—ranging from $7 to $20 in societal returns per dollar invested. We take a conservative approach and assume $7 in returns per dollar invested—the figure that President Obama cited in his State of the Union address in 2013—generated by a combination of increased family income, educational attainment, and reduced societal costs such as incarceration and special education. This figure is roughly in line with Nobel Laureate James Heckman’s calculations that the Perry Preschool program and the Chicago Child-Parent Centers had benefit-cost ratios of 9:1 and 8:1, respectively, and that the Perry Preschool program’s internal rate of return was in the range of 7-10 percent.1 We assume impact over the period during which we can be sure that the school will remain open (e.g., the term of our financing)—a conservative assumption, since centers usually continue to serve children from low- and moderate-income families for many years after our grant term ends. Finally, we calculate IRR based on our tabulation of data from the Heckman et al cost-benefit study of the Perry Preschool Program showing when, from childhood into adulthood, individual and societal impact occurred. 1 Heckman, James, and Dimitriv Masterov. 2007. “The Productivity Argument for Investing in Young Children.” Lecture given as the T.W. Schultz Award Lecture at the Allied Social Sciences Association annual meeting, Chicago, January 5-7; see also: Heckman, et al. 2009. “The Rate of Return to the High/Scope Perry Preschool Program.” National Bureau of Economic Research Working Paper No. 15471. Education is one of the most important factors in unlocking opportunity and improved quality of life for low-income people. According to Social Security Administration (SSA) projections, those graduating with no more than a high school degree today will earn approximately $645,000 more in current dollars over their lifetimes than those who drop out.1 We use this figure to estimate lifetime earnings boosts generated by LIIF-supported schools that achieve higher high school graduation rates relative to district averages, and assume impact over the period during which we can be sure that the school will remain in operation (e.g., the term of our financing) —a conservative approach, since schools usually continue to operate many years after investors are repaid. Finally, we calculate IRR using SSA projections of when, over the course of lifetimes, incremental income boosts from graduating vs. dropping out will occur. 1 Office of Retirement Policy, Social Security Administration. MINT 7 projections. To estimate societal benefits of high performing K-12 schools other than increased earnings potential for students, we again rely on evidence around the impact of boosting high school graduation rates. Multiple estimations exist for lifetime avoided social costs to taxpayers (e.g., higher tax revenues, lower incarceration rates, lower government medical expenditures) of graduating high school as opposed to dropping out. We rely on the most cited study—which places this value at just over $200,000 in current dollars 1 —and assume impact over the period during which we can be sure that the school will remain open (e.g., the term of our financing). 1 Levin, et al. 2007. See also Sum, et al. 2009. “The Consequences of Dropping Out of High School: Joblessness and Jailing for High School Dropouts and the High Cost for Taxpayers.” Northeastern University Center for Labor Market Studies.” October. Community Health Centers (CHCs) generate significant medical cost savings—much by improving health outcomes, delivering more efficient forms of care, and preventing costly downstream hospitalizations and emergency room visits. Researchers have estimated that health centers generate more than $1,000 in incremental per-patient medical cost savings per year, and this figure is expected to increase in the context of the Affordable Care Act rollout.1 To estimate systems-level medical cost savings generated by health centers that we support, we multiply per-person savings by the number of unique patients served each year, and then assume impact over the period during which we are confident the center will remain in operation—at least the term of our financing, although centers typically operate for many years after, pending review by the Health Resources and Services Administration. Finally, we assume that savings will nominally increase by 6 percent each year due to rising medical costs (the same rate of increase that the Centers for Medicare & Medicaid Services projects for the next 10 years). 1 Ku, et al. 2009. “Using Primary Care to Bend the Curve: Estimating the Impact of Health Care Expansion on Health Care Costs.” The George Washington University School of Public Health and Health Services. 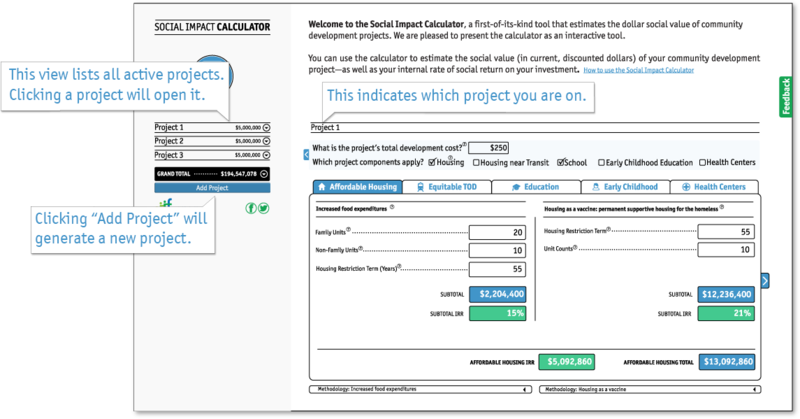 Welcome to the Social Impact Calculator, a first-of-its-kind tool that estimates the dollar social value of community development projects. 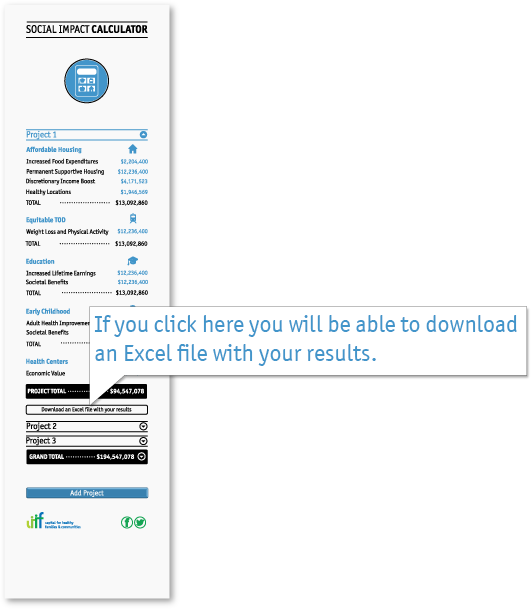 We are pleased to present the calculator as an interactive tool. 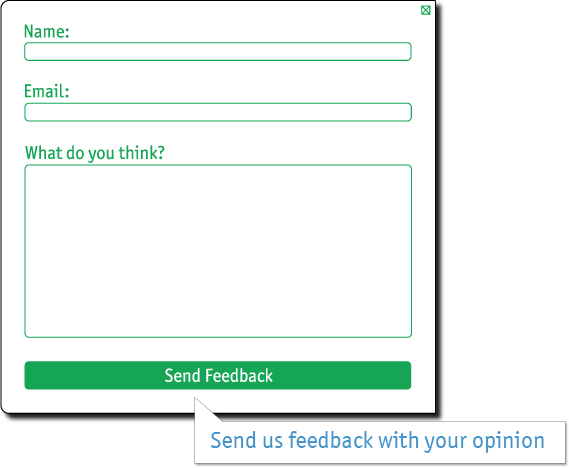 Name: Email: What do you think? 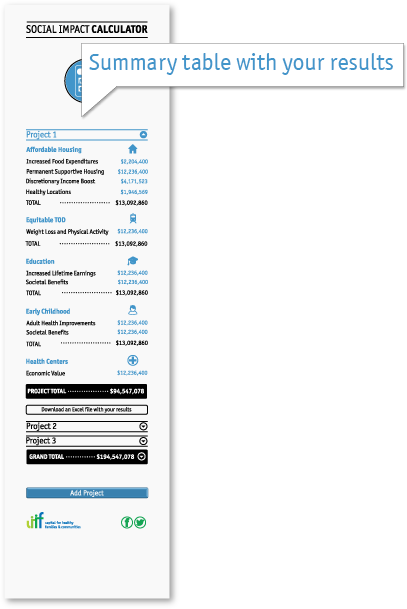 • Type your project data into the input fields, and the calculator with generate an estimate (in current dollars) of your project’s social impact. 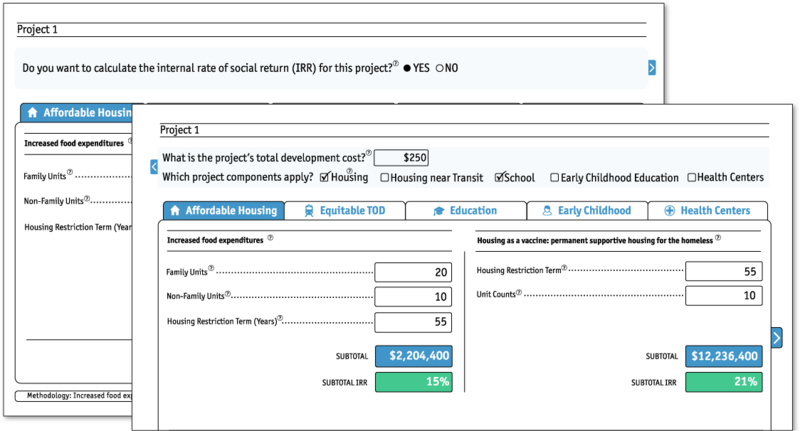 • To calculate the internal rate of social return, click ‘yes’ and then indicate both the total development costs and the components that apply to your project.